MOORESVILLE, N.C., Aug. 26, 2017 /PRNewswire/ — In response to the widespread devastation caused by Hurricane Harvey in Texas, Lowe’s announced today a $500,000 contribution to American Red Cross Disaster Relief to help the Red Cross provide food, emergency shelter, relief supplies and comfort to those affected by disasters like Hurricane Harvey and countless other crises. Lowe’s is working with its national nonprofit partners to provide both immediate and long-term support to local communities. Lowe’s has also activated its American Red Cross customer donation program at its Texas stores to provide a convenient place for customers to make a donation. People also can make a contribution online through the Lowe’s American Red Cross Online Donation Site. 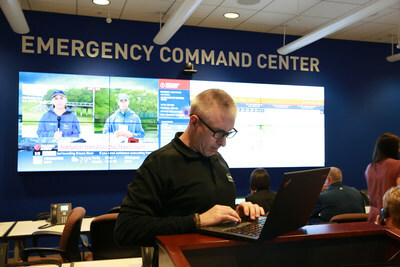 Lowe’s Emergency Command Center continues to expedite truckloads of needed clean-up and recovery supplies including generators, bottled water, gas cans, chainsaws, water removal equipment, insect repellant, shovels, rakes and other tools to our Lowe’s stores impacted by the storm. Lowe’s employs more than 23,000 people in Texas and in the coming weeks, Lowe’s Heroes volunteers will help with relief and recovery efforts in communities affected by the storm. Lowe’s is also supporting employees affected by the storm through its Employee Relief Fund which provides financial assistance in times of crisis. Since it was established in 1999, the fund has helped approximately 26,000 employees by providing more than $29 million in financial aid. As a member of the Red Cross’ Annual Disaster Giving Program, Lowe’s pledges donations on an ongoing basis in advance of disasters to help ensure the Red Cross can take immediate action. Since partnering with the Red Cross in 1999, Lowe’s and its customers have contributed more than $28 million for disaster relief.